Will IRSeeK Have A Chilling Effect on IRC Chat? New Israeli startup IRSeek is indexing public Internet Relay Chat (IRC) channels at the rate of 6 million conversations a day. 300 million conversations have now been indexed by the company. The most popular networks, including EFnet, DALnet, Freenode and QuakeNetUndernet, are all being monitored – IRSeeK is now “listening” to 2000+ channels across 10 networks. There are few IRC search engines today, and most focus on specific niches or single networks, the Company says. Nearly two decades worth of data contained on IRC servers has effectively been lost. 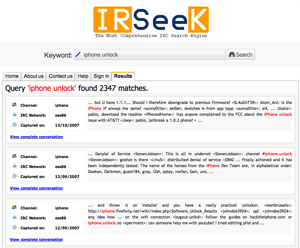 IRSeek wants to make sure that future conversations are properly indexed and and searchable. It’s a huge untapped knowledge-base. So if you want to see what people are saying on IRC about, say, iPhone unlocks, now you can. The most popular search terms populate a query could on the front page of the site. The company was founded by Eran Cohen (CEO), and Ariel Berkman (CTO). Development began in mid-2006. The company says a channel is dropped when file sharing activity is detected and private conversations are not eavesdropped in anyway. Still, some IRC users, who have a possibly unreasonable expectation of privacy, may be troubled by IRSeeK . Personal information is often revealed in IRC chats. That information is now indexed and searchable. Searches can also be conducted by IRC nicknames, and all conversations involving that nickname (or even if they were just in the room) are linked. Of course, nicknames aren’t unique and many users may choose the same nickname over time. But even so, the knowledge that everything being typed can be later found by others may have a chilling effect on users.